As many of you know, Becky E Hites serves on the board and as CFO for the Atlanta Council on International Relations (ACIR). 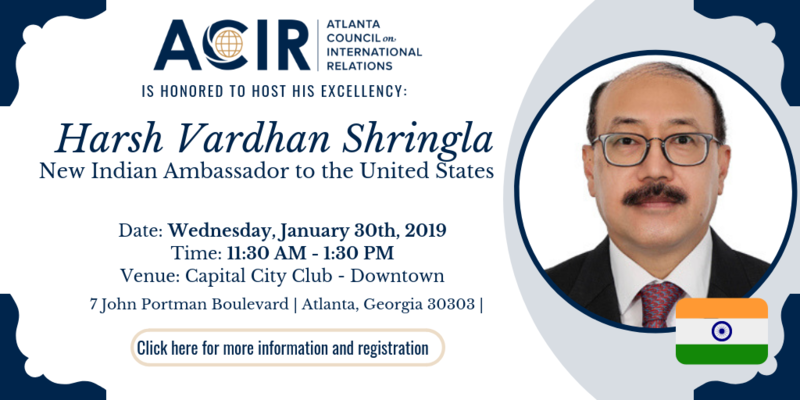 ACIR is honored to host the new Indian Ambassador to the United States, Harsh Vardhan Shringla, who will speak on the topic, "U.S.-Indian Relations. "Come listen to Ambassador Shringla speak January 30 about the current and future bilateral relationship between India and the United States. With 1.3 billion people, India is the ninth largest goods trade partner with the U.S. with room to expand that relationship. Ambassador Shringla became India's Ambassador to the United States after presenting his credentials to President Trump on January 11, 2019. This visit to Atlanta marks his first visit outside the nation's capital, and the ACIR has the good fortune to play host to him ahead of other Indian Consulates and Washington, D.C. think tanks all vying to be the first to host the ambassador. A career foreign service officer, prior to arriving in the U.S. the ambassador served as the High Commissioner of India in Bangladesh. In the course of his diplomatic career spanning more than 35 years, Ambassador Shringla held a variety of positions in New Delhi and also in Indian missions in Paris, Hanoi, and Tel Aviv. He also served as Minister/Counselor in the Permanent Mission of India to the United Nations, New York and as Consul General in Ho Chi Minh City of Vietnam and Durban, South Africa. Click here for more information and the link to the lunch registration. We're expecting over 100 attendees and will close registration at 10 am on Friday, Jan 25, so make your plans to attend now.